I’m reflecting on inertia today: many organisations desire agility, want to change, intend to do better, and yet fall to constraint. Within the work on the Socially Dynamic Organisation, ‘constraint’ is a state of well intentioned inability: an inability to change, an inability to gain momentum, an inability to adapt. Often the issue lies within embedded, current state manifestations of power, and the ways in which we nest within, and are subject to, the whims of that existing structure. 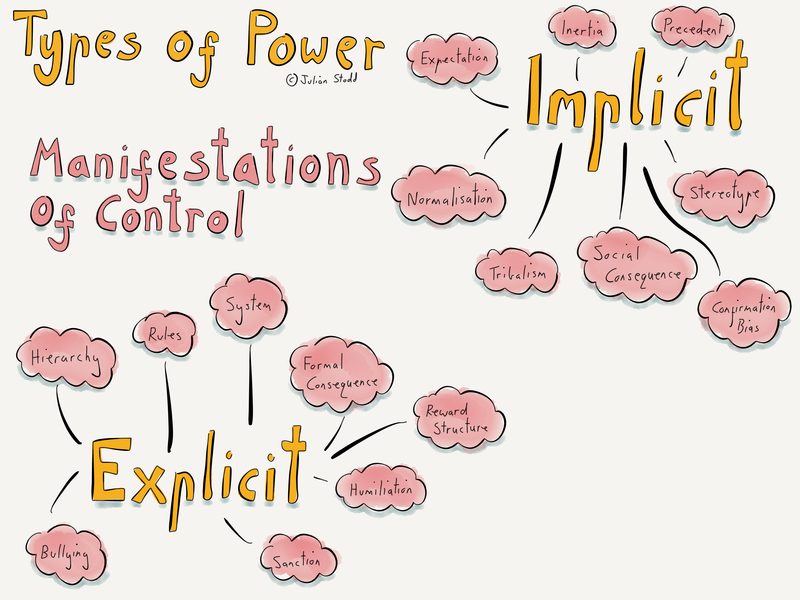 As part of my own thinking on this, i’m mapping out some of the ways in which power is exerted, in both formally visible ways, which are explicit, and less obvious, implicit, manifestations. Formal power is manifest in formal hierarchy: codified and embedded structures of power which, broadly, map out who can apply consequence, and formal flows of instruction and control. Rules are another codification of power and control. Systems, both human and technical, codify ways of working and behaving, they drive consistency and implement both rigid and fluid control. Reward, promotion, and developmental pathways all act as mechanisms of both engagement and control. More negatively, bullying and formalised humiliation (in the form of league tables and public scoring metrics, or visible associations with failure) can be used in fractured cultures to act as preventative or punitive manifestations of power and control. The direct application of consequence and sanctions acts as a form of control. On the implicit side, expectation can act as a mechanism of control: it forms a soft shell around anticipated or expected behaviour and implicitly removes permission to act otherwise. Inertia can be used as an implicit form of control, simply not dong something. Stereotypes can be harmless, but also normalise inequality and existing structures of power and hence control. Similarly, precedent: if nobody has challenged in a specific way before, that route to challenge can implicitly be blocked. Internally, confirmation bias can lead us to self reinforce existing structures of power. Socially, tribalism can lead us to withdraw from challenge through a fear of exclusion, and direct social consequence implicitly blocks dissent and challenge, by applying a fear of exclusion, bullying and acceptance. It’s important to reflect upon and understand the mechanisms by which control is exerted: in some senses, this is a guide to the development of Social Leadership, as well as a lubricant for change. If we wish to move from ‘constraint’, to ‘dynamic’, in the language of the Dynamic Change Framework, then we need to overcome both explicit and implicit mechanisms of control. Social systems are not held static purely by formal rules and intent: often they desire change, but are simply unable to effect it, but the constraint is not imposed from outside, it’s engineered from within. This type of control can be the antithesis of agility, in both logistical and mindset terms. Power within social systems is complex, and organisations are predominantly social systems, so anything we can do to reflect upon, and consider change within, the rules of these systems, can be valuable as we strive to build a more Socially Dynamic, adaptive, fair and inclusive organisation. This entry was posted in Control and tagged Bias, Consequence, Control, Inequality, Leadership, Power, Social Age, Social Leadership, Socially Dynamic Organisation, Stereotype. Bookmark the permalink.